Okay, so, usually we have a substantial post-awards show wrap-up after an awards show. I even live blog the Oscars. But the People's Choice Awards don't count. If you watched them last night, you know what I mean. I did, however, try to peruse the winners' list this morning, but as soon as I opened my laptop, I was assaulted with the photo above. Nightmare. 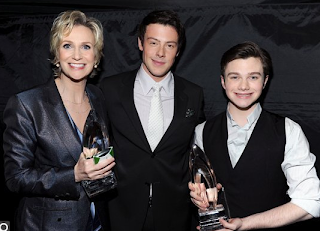 Don't get me wrong: Jane Lynch is a genius, and both of those boys seem like fine young men, but "Glee" makes me want to drink bleach. The minute that Matthew Morrison dude opens his mouth, my soul breaks out in hives. All to say, if you want to know what happened last night, The Huffington Post has posted a lovely summary of the evening's honors. You can check it out here. People's Choice. Psssh. Talk to me after the Globes, mm-kay?